Catholic Education in New Jersey is thriving in many ways, but state aid is not one of them. The often overlooked, but very expensive, concern of bus transportation for our students is now a hot button issue that threatens the very foundation of school availability. This is a major issue that must be address in Governor Christie’s upcoming budget. Nonpublic school transportation continues to be hampered by a number of problems which emphasize the major difficulties that nonpublic school parents face in attempting to get safe rides to school for their children. Many parents cannot continue to enroll their students in nonpublic schools without this increase. Currently, the state only funds school bus transportation for a maximum of $884 per student. Many bus companies and public school districts are unwilling / unable to transport students at the $884 rate. Ideally, the bus transportation rate should match cost of living increases, which has not happened since the 2007-2008 school year. Click here for a Fact Sheet containing more information. Ask Governor to increase funding for nonpublic school transportation in his upcoming Fiscal Year Budget. If your family has been affected by this problem, or you know of families who have, tell the Governor the details. Even if the bussing problem does not apply to you, but you believe in Catholic education, please contact Governor Christie. How can you contact Governor Christie? 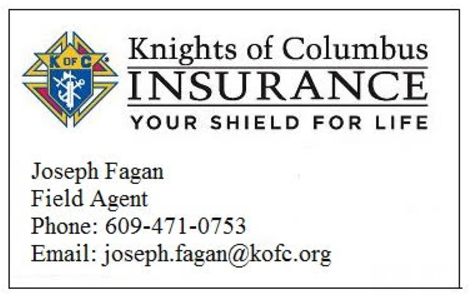 The New Jersey State Council of the Knights of Columbus supports the New Jersey Catholic Conference‘s efforts to get state aid for school bus transportation increased in the next budget. FS Ray Iacovone, GK Jim Cosgrove, Treas. Ed Welsh and Warden Tony Hocker pose during the awards ceremony of the January 2017 council meeting. During the first council meeting of the year, several of our Knights were recognized for their service. Knight of the Year – Chancellor, Al Duaime. Al was an integral part of our counsel this year stepping up and taking the initiative of ideas such as coordinating the Columbus Day breakfast, representing our council at confirmation and providing food for the color guard, assisting in ticket sales, becoming Knight of the Month in May and becoming a Sir Knight in November making his 4th degree. We appreciate Al’s passion for our council, our parish and the Knights. Family of the Year: Schlager Family. Many thanks to Mark and his family for always being there when they can. They are always available to help during events, setting up, cleaning up or praying the rosary. We always see them at mass together as a family and ready to assist with anything the Knights or Parish may be doing at the time. Thank you to Mark and his wonderful family. Patriotic Award: Treasurer, Ed Welsh. This is not one of our regular awards, and is the first time it has presented to a brother Knight. The 4th degree is a patriotic degree in the Knights, and who better than Ed, a true Patriot to our country and our council, should receive it. Ed’s service to our country, commitment to our council and outstanding job as Treasurer has truly earned him the title of Sir Knight. Thank you Ed for your service to our great country, our council and our parish. Certificate of Achievement: FFS, Neal Cullen. As our first Financial Secretary since reactivation, Neal had huge challenges ahead to get our council back on track with paperwork, collecting dues, updating our list of brothers and tracking down their locations, sending out numerous mailings, distributing membership cards and of working with the IRS to reestablish the council’s tax id status. The FS is a demanding position that requires 3 years of service. Neal did an outstanding Job and we thank him for all his hard work. Certificate of Appreciation: Trustee 2nd year Ray Iacovone. Newly appointed FS Ray Iacovone was recognized for coordinating and implementing the FaithFULL food drive in 2016. We had one of our best food drives due to Ray’s customized paper grocery bags that made the ease of donations much easier for parishioners. Ray triumphed over several adversities, including a broken down borrowed truck, to make sure the job got done. All ended well thanks to Ray’s tenacious efforts. Our council was also recognized by the Supreme Council of the Knights of Columbus as a recipient of the Columbian Award. This award is given to councils that annually conduct and report at least four major involvement programs in each of the following sections of the Service Program: Church activities, community activities, council activities, family activities, and youth activities. We are honored to be recognized for our service during the prior fraternal year. Grand Knight Jim Cosgrove and Trustee Dom Scarcella were thrilled to attend the recent First Holy Communion masses for both English and Hispanic communities of St. Bridget’s Parish. Each child was presented with gifts from our council. Grand Knight Jim Cosgrove had the pleasure to dine with Fr. Matthew Webber, Fr. Michael Goyette, fellow GK’s, DD’s, FS’s, etc, and show the appreciation of Knights everywhere towards our clergy at the 2016 Pride in Our Priests Banquet. Big thanks to Adelphia for providing and outstanding meal. Good to see such a great turnout for this wonderful event. Vivat Jesus! The Knights of St. Bridget’s are always ready to help and engage with the various ministries in our parish. We were recently overjoyed to be welcomed in by the Catholic Campus Ministry of Rowan University. On Wednesday nights during the school year, Rowan CCM opens its doors to the community for faith and fellowship dinners. On April 6, we were happy to provide dinner and dine with the Catholic students of Rowan. Thank’s to our chef (and financial secretary) Neal Cullen, all those in attendance enjoyed a fantastic barbeque dinner! We are very excited to work with the students of Rowan CCM in the future! Go Profs!